Bournemouth welcome West Ham to the Vitality Stadium ​on Saturday afternoon for a Premier League clash that promises entertainment. The Cherries have both scored and conceded goals for fun this season but after an encouraging start to the campaign Eddie Howe's men have struggled in recent weeks, recording just one victory during their last nine outings in all competitions, a run of results that has seen them slip to 12th in the table. In contrast, the ​Hammers endured a sticky start to the season losing their opening four ​Premier League fixtures. However, Manuel Pellegrini's system is starting to take shape having mustered an impressive 1-0 win over ​Arsenal last time out, and his side now sit just one point behind seventh placed ​Watford heading into Saturday. ​Bournemouth are sweating over the fitness of star man Callum Wilson who is rated 50/50 for Saturday as he continues his recovery from a hamstring problem. If unavailable, ​Josh King is expected to lead the line hoping to add to his tally of five Premier League goals this season. Long term absentees for the Cherries are Lewis Cook and Simon Francis with both expected to miss the remainder of the season with cruciate ligament injuries. However, ​Liverpool right-back Nathaniel Clyne arrived at the Vitality Stadium this window as cover for Francis. He is expected to line-up in defence once more after making his debut in the 2-0 defeat to Everton last time out. West Ham have been plagued by injuries all season and will be without as many as eight first-team players. Notable absentees include big money summer signing ​​Andriy Yarmolenko, ​Jack Wilshere and ​Manuel Lanzini, who are all out with serious injuries. Talisman ​Marko Arnautovic has been at the centre of much transfer talk over the past week, as a potential £40m move to China continues to be touted. With no further developments, the Austrian may well start on Saturday although ​Andy Carroll will be poised to replace him after his return to full fitness. ​West Ham ​Fabianski; Zabaleta, Diop, Ogbonna, Cresswell; Noble, Rice; Anderson, Nasri, Antonio; Arnautovic. This fixture will mark just the 13th time the pair have met in all competitions, with the Hammers just shading the better record. West Ham have claimed five victories, whilst losing out three times to their south-coast counterparts. Eddie Howe's side can take encouragement from more recent clashes however, as they are undefeated in their previous four outings against the London side, winning twice and drawing two. Bournemouth have been on a woeful run of late and have won just once in their last nine games in all competitions. Their defensive frailties have been at the forefront of their poor form, conceding an incredible 17 goals in their last five fixtures so will need a more resilient performance on Saturday to keep the free-scoring Hammers at bay. Manuel Pellegrini will be delighted with his side's recent form, having won six of their last nine Premier League fixtures. 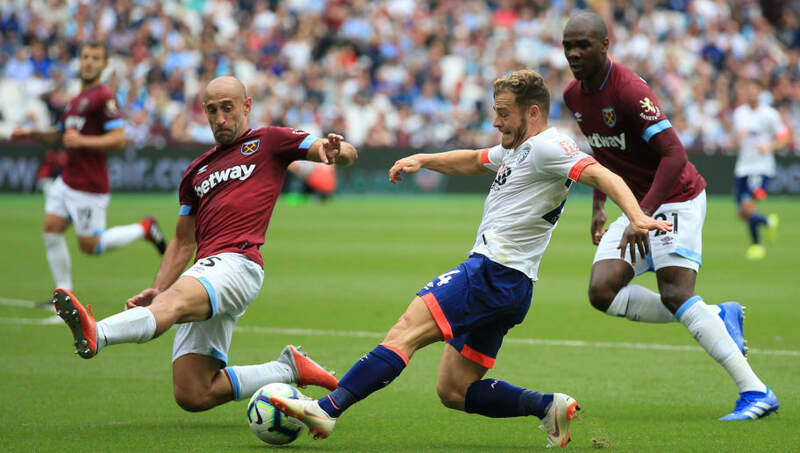 Victory over the Gunners last weekend reiterated the improvements that have been made at the London Stadium as the Hammers ran out deserved 1-0 winners. The form of Felipe Anderson, Declan Rice and Arnautovic has been crucial to their resurgence, although much of this weekend's game may depend on the latter's availability as it appears the Austrian wants away from the club. With Bournemouth being on the slide in recent weeks, West Ham may well edge the clash as Manuel Pellegrini continues to mastermind the Irons' surge up the Premier League table. Goals will be expected as both sides have a tendency to throw men forward and leave their defence exposed, which should result in an entertaining affair. The Hammers may just have too much firepower going forward with Anderson in sparking form in his debut season in the Premier League - the Brazilian has already bagged eight goals and two assists, and could add to his tally this weekend.